GF Ontario Blog: Astoria Mills Creates Endless Possibilities! 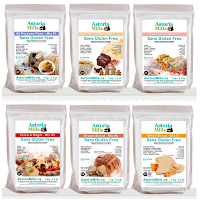 Astoria Mills has created an amazing lineup of gluten-free flour mixes, allowing you to create anything your heart desires! Trina herself visited my home last year and we spend an entire day baking amazing treats! Pizza, fresh made pasta, crackers, bread... phew. It was a fun-filled day and I got to take home the souvenirs. It is comforting knowing that all of these products have gone through very strict procedures to ensure the finished product is certified gluten-free. You can head on over to Astoria Mills and get your hands on the full line of baking mixes!